Loseley Park lies to the south of Guildford, close to the A3 with its direct links to the M25 and London and offers the visitor a peaceful and fascinating day out as well as being a highly regarded venue for corporate hospitality and shows. Loseley has been in the same family for over 400 years. The house is a good example of Elizabethan architecture, featuring many fine works of art including paintings, tapestries and panelling from Henry VIII’s Nonsuch Palace. The Walled Garden, based on a design by Gertrude Jekyll, has been compared favourably with gardens of national repute and contains a series of ‘rooms’ with different themes gardens running through them. The redevelopment of the Garden commenced in 1993/4 with the Rose Garden and continued with the Herb Garden, Flower Garden, White Garden and most recently, the Organic Vegetable and Cut Flower Garden. The Gardens are surrounded by a magnificent old wall of similar age to the House and contain a Vine Walk, a huge spread of Wisteria, the Moat and Moat Walk, and the old Mulberry Tree. A plant sales area is open in the summer months where plants grown in the garden are available for sale. Loseley Park is the family home of the More-Molyneux family. The More family established itself in Surrey in 1508 when Christopher More, the son of a London fishmonger, purchased the manor of Loseley and obtained legal training. More held a number of offices and was returned as one of the two Members of Parliament for Surrey in 1539 and 1547. In 1533 Henry VIII granted him a licence to impark and surround with hedges, ditches and pales, 200 acres of land at his manor of Loseley. Christopher’s son, William More, one of Queen Elizabeth’s most trusted advisers, replaced his father’s house with the present house between 1562-68. Much of the building stone for Loseley House was taken from Waverley Abbey, near Farnham, which became a ruin after the dissolution of the monasteries in the 1530s. Queen Elizabeth visited the house on a number of occasions; 1577, 1583 and 1591. William’s son, George More enjoyed royal patronage under James I and was able to extend both the house and the estate. He achieved good marriages for four of his five daughters but was appalled by the union of his daughter Anne with the poet, John Donne. In the 18th century the family fortunes declined, but improved by the 19th century. In 1905 Gertrude Jekyll provided plans for a north bed under the Kitchen Garden wall, for Rose beds and for a long border outside the main wall parallel to the moat. It is possible that Miss Jekyll was involved with the garden over a longer period of time as she photographed the site in 1883. Paintings and photographs of Loseley from the period 1880 until 1900 show a garden in the Jekyll style of mixed borders and formal paths. 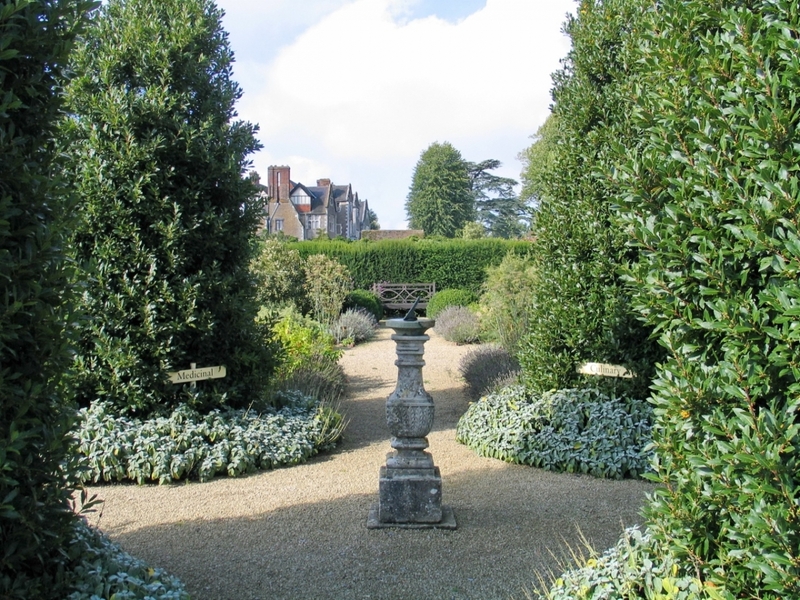 Yew hedges still survive today as do the Mulberry and Cedar trees noted on Miss Jekyll’s plan. Her work also survives in the style of planting on the terrace wall, the steps and the herbaceous border along the moat edge. Miss Jekyll’s book ‘Wall, Water and Woodland Gardens’ contains a photograph of Loseley from the south entitled ‘An old moat wall’ and gives advice about suitable plantings. The book was first published in 1901. The garden at Loseley was described in ‘Country Life’ in 1899, as containing unusual bamboo and Chusan Palms (Chamaerops Fortunei) which can still be seen today. Yuccas are also in evidence as are some old fruit trees in the moat border. The planting is still evocative of Miss Jekyll’s designs, including climbing roses, lavender and daisies. During and after the First World War Loseley, like many estates struggled with labour shortages. In another ‘Country Life’ article about Loseley in 1935, Christopher Hussey writes a great deal about the More family and the house but very little about the garden except to note: – ‘These consist of a square enclosure with brick gazebos at three corners and a canal or moat along the south side, where a broad grass walk is terraced on a retaining wall above the canal. In its present form, with its massed yew hedges, the garden probably dates from the second half of the 17th century, though much of the picturesque planting on the terraces is due to the advice of the late Gertrude Jekyll’. After World War II the estate owed duties and the house lacked electricity and had a leaky roof. The More-Molyneux family have carried on a number of enterprises, including the famous Loseley Jersey herd which produced dairy products for many years, organic farming and gardening and catering for weddings and other functions. The garden at Loseley is now maintained at a high standard to complement the outstanding house. 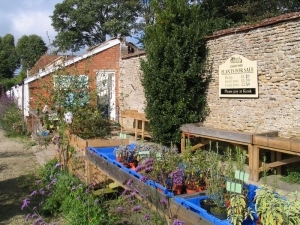 A plant sales area is open in the summer months where plants grown in the garden are available for sale. A number of events during the year. See website for details.